How Do You Graph a Relation From a Table? 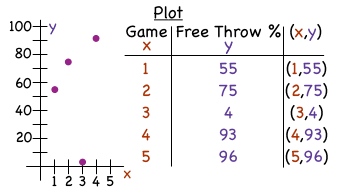 When you have a relation given as a table of x-values and y-values, it can sometimes be helpful to graph those points in order to get a visual representation of the relation. This tutorial will show you how to take values from a table and plot them on the coordinate plane! How Do You Write a Relation from a Word Problem? Word problems are a great way to see math in action! In this tutorial, see how to write a relation from the information given in a word problem. Then, plot the points in the relation to get a graph that shows the relation!